Nicholas Boccasini was born into a poor family of which we know little else, though there are several different traditions concerning it. One claims that his father was a poor shepherd. Another that he was an impoverished nobleman. Whichever he was, he died when Nicholas was very small, and the little boy was put in the care of an uncle, a priest at Treviso. The child proved to be very intelligent, so his uncle had him trained in Latin and other clerical subjects. When Nicholas was ten, his uncle got him a position as tutor to some noble children. He followed this vocation until he was old enough to enter the Dominican community at Venice in 1254. Here, and in various parts of Italy, Nicholas spent the next 14 years, completing his education. It is quite probable that he had Saint Thomas Aquinas for one of his teachers. Nicholas was pre-eminently a teacher at Venice and Bologna. He did his work well according to several sources, including a testimonial from Saint Antoninus, who said that he had “a vast store of knowledge, a prodigious memory, a penetrating genius, and (that) everything about him endeared him to all.” In 1295, he received the degree of master of theology. The administrative career of Nicholas Boccasini began with his election as prior general of Lombardy and then as the ninth master general of the Order of Preachers in 1296. His work in this office came to the notice of the pope, who, after Nicholas had completed a delicate piece of diplomacy in Flanders, appointed him cardinal in 1298. The Dominicans hurried to Rome to protest that he should not be given the dignity of a cardinal, only to receive from the pope the mystifying prophecy that God had reserved an even heavier burden for Nicholas. As papal legate Nicholas traveled to Hungary to try to settle a civil war there. Boniface VIII did not always agree with the man he had appointed cardinal-bishop of Ostia and dean of the sacred college. But they respected one another, and in the tragic affair that was shaping up with Philip the Fair of France, Cardinal Boccasini was to be one of only two cardinals who defended the Holy Father, even to the point of offering his life. Philip the Fair, like several other monarchs, discovered that his interests clashed with those of the papacy. His action was particularly odious in an age when the papal power had not yet been separated completely from temporal concerns. The French monarch, who bitterly hated Boniface, besieged the pope in the Castle of Anagni, where he had taken refuge, and demanded that he resign the papacy. His soldiers even broke into the house and were met by the pope, dressed in full pontifical vestments and attended by two cardinals, one of whom was Cardinal Boccasini. For a short time it looked as though the soldiers, led by Philip’s councilor William Nogaret, might kill all three of them, but they refrained from such a terrible crime and finally withdrew after Nicholas rallied the papal forces and rescued Boniface from Anagni. Cardinal Boccasini set about the difficult task of swinging public opinion to the favor of the pope. Successful at this, he stood sorrowfully by when the pontiff died, broken-hearted by his treatment at the hands of the French soldiers. On October 22, 1303, at the conclave following the death of Boniface, the prophesied burden fell upon the shoulders of the cardinal-bishop of Ostia, who took the name Benedict XI. 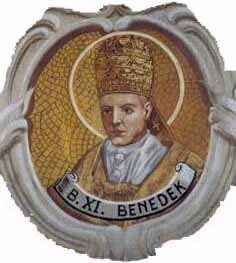 The reign of Benedict XI was too short to give him time to work out any of his excellent plans for settling the troubles of the Church. Most of his reign was taken up with undoing the damage done by Philip the Fair. He lifted the interdict on the French people that had been laid down by his predecessor and made an uneasy peace with Philip. He worked to reconcile warring parties in Europe and the Church and to increase spirituality. His reign, short though it was, was noted for its leniency and kindness. There are few personal anecdotes regarding Benedict, but at least one worth telling. Once, during his pontificate, his mother came to the papal court to see him. The court attendants decided that she was too poorly dressed to appear in the presence of the Holy Father, so they dressed her up in unaccustomed finery before allowing her to see her son. Benedict, sensing what had happened, told them he did not recognize this wealthy woman, and he asked them where was the little widow, pious and poorly dressed, whom he loved so dearly. Benedict XI died suddenly in 1304. He had continued to the end with his religious observances and penances. Some people believed that he had been poisoned, but there has never been any evidence that this was the case. Many miracles were performed at his tomb, and there were several cures even before his burial. Representation: In art, Pope Benedict wears a Dominican habit and papal tiara, while holding the keys. He is venerated in Perugia.